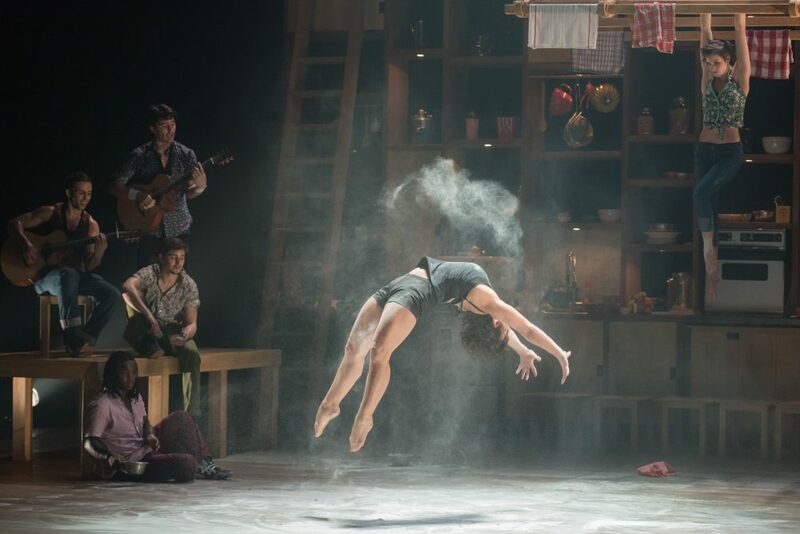 Even before the start of “Cuisine & Confessions,” the newest production from Montreal-based circus troupe Les 7 Doigts De La Main (“7 Fingers of the Hand”), preparations for the evening’s batch of banana bread and pasta were well underway. So were the cast’s reminiscences. “When I was little, my mother taught me how to crack eggs with just one hand,” Matias Plaul, one of the company’s two Argentines, recollected. He then issued the challenge to the audience: Who could do the same? Safely ensconced in my seat, I smiled smugly to myself: Well, I could, actually, and with either hand. But any sense of prideful self-congratulation quickly evaporated as the show’s nine performers took to their stage — outfitted like a kitchen — with the greatest of ease, flinging themselves through the air with as much aplomb as they flung flour or played catch with gleaming metal bowls. So began ArtsEmerson’s 2016-'17 season and the troupe’s fourth visit to Boston. If you had seen any or all of the earlier shows (“PSY,” “Sequence 8,” “Traces”) you would have had some idea of what to expect. There were dramatic feats of physical prowess, choreography that touched upon everything from ballet to hip hop (with plenty of acrobatics blended in), inventive staging and nonstop music. It was all delivered by a talented, daredevil cast of international performers. 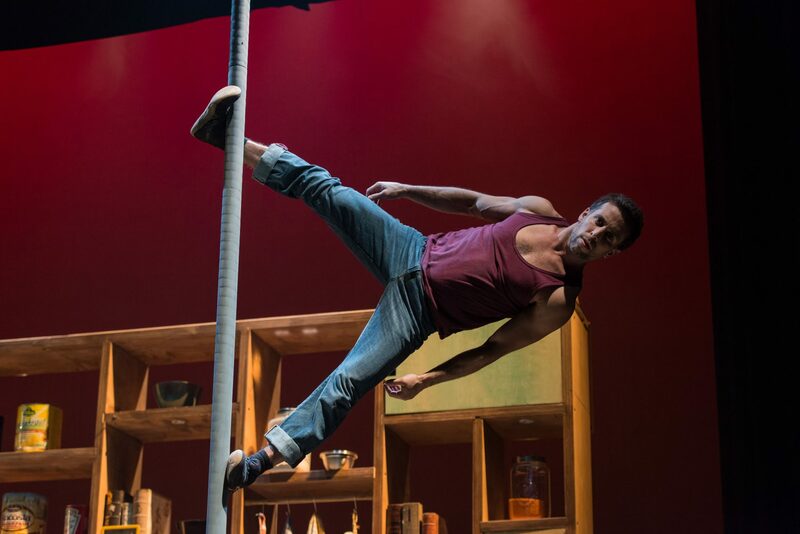 This was a show sure to delight cooking enthusiasts, acrobatics fans or anyone with an inner child willing to be dazzled by sheer magical physicality. It was not just a circus act, but a consummate work of theater, too. The set was dominated by a large system of shelves standing wide and tall against the back wall, with ingredients and implements stashed high up on almost inaccessible niches. (One salivated as much at the thought of seeing how the nimble acrobats were going to access their supplies as one did at the delectable fragrances the working oven and stovetop produced.) Cleverly designed tables and chairs pulled out from each other like a stack of Russian dolls by way of Ikea furniture. 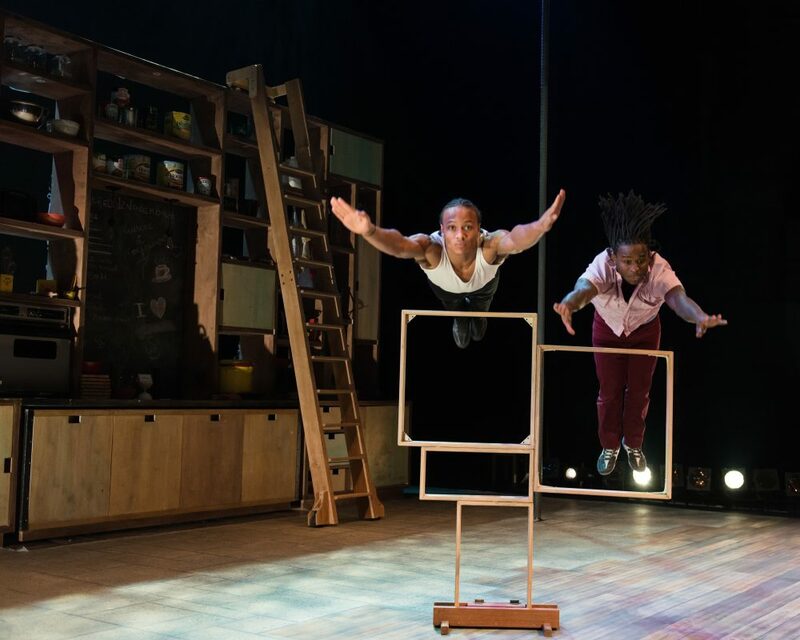 All this meaty, well-conceptualized design work was grist for the 7 Fingers mill, as the troupe’s members danced, rolled, soared and tumbled around the space, reconfiguring set pieces and demonstrating new ways to have fun with utensils. Have you ever noticed how industrial-sized whisks resemble juggling pins? This lot certainly did, and they made the most of the similarity. Other uses for standard household items abounded, with a suit of armor being cobbled together during a gleefully energetic mock-infomercial and Russian aerial silk artist Anna Kichtchenko performing a routine with an oversized tablecloth. Needless to say, don’t try any of this at home lest it’s your goose, and not the pot roast, that ends up cooked. Co-directors Shana Carroll and Sébastien Soldevila, a married couple who are among the troupe’s seven co-founders, merged the stunts and choreography with the performers’ personal recollections. The most stirring of these was the story Plaul told of his father being “disappeared” by Argentina’s military government. Plaul punctuated his story with aggressive choreography and (almost literally) breakneck stunt work on the Chinese pole. More than once, everyone in the house sat up with an alarmed gasp, certain that Plaul was about to crash face-first into the floor. With masterful control, he avoided catastrophe time after time. Here and there, one spotted a minor cheat. The stackable frames through which American acrobats Melvin Diggs and Sidney Iking Bateman arced and plunged were made to look like wood, but flexed and wobbled like rubber, giving the acrobats considerably more leeway to brush against the frames. The resulting wobbles distracted the eye. Overall, though, that didn’t detract from the troupe’s accomplishments. On the one or two occasions when a stunt didn’t quite go as planned, the humanity of the moment only drove home the fact that, as easy as the acrobats made it all look, the stunts they executed were awfully difficult to master, and they were only possible at all for performers of almost superhuman caliber. Those occasional human moments also made their personal stories all the more poignant. "Cuisine & Confessions" is at the Cutler Majestic Theatre through Aug. 7.